California’s newly declared Democratic Senate candidate Kamala Harris has come under fire from pro-Israel activists for repeatedly refusing to take legal action against a California State University professor accused of using his taxpayer-funded website to promote boycotts of Israel, a move the activists claim violates the law. Harris, who serves as the state’s attorney general, has declined multiple requests from pro-Israel organizations to sue California State University, Northridge (CSUN) mathematics professor David Klein, who they accuse of violating the law by using his university-provided website to promote the virulently anti-Israel Boycott, Divestment, and Sanctions (BDS) movement. The pro-Israel camp has charged in multiple letters that Harris is "abdicating her responsibilities" as attorney general by ignoring Klein’s violations and refusing to take legal action against him. 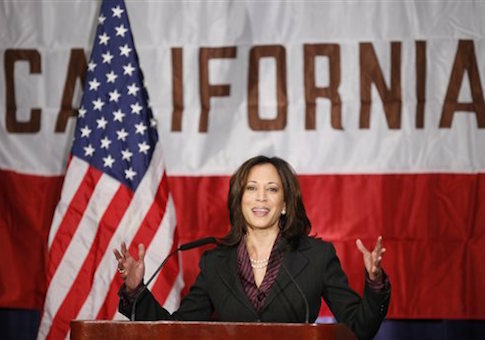 Pro-Israel activists and political insiders in California say that the issue could hurt Harris among Jewish voters as she seeks to win retiring Sen. Barbara Boxer’s (D.) Senate seat. "Bottom line, does Kamala Harris oppose efforts to boycott Israel? Because, at best, her actions in the matter demonstrate a certain ambivalence," said Arie Lipnick, a political consultant with ties to California’s Jewish community and its leaders. "Is ‘ambivalent’ enough for pro-Israel Californians or will they back a candidate with stronger anti-boycott convictions? For some Democrats it will undoubtedly be the former but I would hope for the bulk of the community it's the latter." The controversy over Klein’s public university-funded website first received attention in 2011, when pro-Israel legal experts with the AMCHA Initiative, the Israel Law Center, and the Global Frontier Justice Center petitioned Harris to take action. Klein is a member of the U.S. Campaign for the Academic and Cultural Boycott of Israel and serves as the faculty adviser to CSUN’s branch of Students for Justice in Palestine, which advocates in favor of BDS. He uses his university-provided website, which is publicly funded, to promote BDS. Klein, the pro-Israel groups argue, is in violation of state statutes prohibiting taxpayer-funded resources from being used for non-business related causes. However, Harris "rejected" their request to take action, claiming instead that Klein is exercising his free speech rights, according to Tammi Benjamin, co-founder and director of AMCHA. Another attempt to raise the issue in 2012 also was ignored by Harris, the groups say. At that time, Harris informed the pro-Israel camps that she did not believe there was enough evidence to pursue action against Klein. Her response, Benjamin said, "was just very curt and short." Ongoing attempts to remove the BDS propaganda from Klein’s CSUN site have been ignored by Harris’s office, the groups say. This has prompted the Global Frontier Justice Center to accuse Harris of shirking her responsibilities as attorney general. "Perhaps Ms. Harris disagrees with our legal analysis, but she provided no contrary analysis," the group wrote in a 2012 letter. "More likely, she is merely abdicating her responsibilities as Attorney General of the State of California." Benjamin maintains that Harris’ efforts to brush the issue aside have sparked concern in the pro-Israel community. "We were concerned because we thought, wait a second, did she really consider this? Does she understand? We did not exactly understand why she would give such a curt reply," Benjamin said. "The law seems to be crystal clear—you can't use the state resources for personal or political purposes." These interactions with Harris have left pro-Israel activists such as Benjamin questioning her commitment to defending the Jewish state from its fiercest critics. It "is definitely my conclusion [that] she's not responsive," Benjamin said. "This has raised a lot of concern in the Jewish community." "The universities, in many ways, are out of control and the university admin [at CSUN] is not willing to do anything," she added. "Kamala Harris is saying it's OK."
A request for comment made to Harris’ newly declared Senate campaign was not returned.